We are excited to announce availability of the new H-series virtual machines in Azure. With the availability of these new VM sizes we continue our mission to deliver great performance for HPC applications in Azure. H-series VM sizes is an excellent fit for any compute-intensive workload. They are designed to deliver cutting edge performance for complex engineering and scientific workloads like computational fluid dynamics, crash simulations, seismic exploration, and weather forecasting simulations. The new H-series sizes are initially available in the South Central US Azure region and will be rolled out across other regions in the near future. The H-series VMs will be available in six different sizes, all based on Intel E5-2667 V3 3.2 GHz (with turbo up to 3.5 GHz) processor technology, utilizing DDR4 memory and SSD-based local storage. The new H-series VMs furthermore features a dedicated RDMA backend network enabled by FDR InfiniBand network, capable of delivering ultra-low latency. RDMA networking is dedicated for MPI (Message Passing Interface) traffic when running tightly coupled applications. We see a large number of enterprise customers embracing Microsoft Azure for their enterprise HPC workloads. Enterprise customers bursting their HPC jobs to Azure for additional compute power helping to solve complex design of experiments (DOE), optimizations, and other critical projects. One of our premier partners, Altair Engineering Inc., with its suite of enterprise computing products is an excellent and current example of integration between customers' on-premises environment and H-series VMs in Azure. H-series VMs can deliver great performance running a variety of applications, helping businesses around the world reducing their product development cycle and bring products faster to market. H-series virtual machines provide on demand compute capacity for our customers that want to solve complex automotive crash simulation problems. Through partners like d3View we can bring large scale computing capabilities to our customers when needed. The low-latency RDMA network enabled by FDR InfiniBand in the H-series VMs, particularly using the H16r and H16mr sizes, make up an ideal combination for delivering the necessary scale and performance for very large CFD (Computational Fluid Dynamics) simulations. 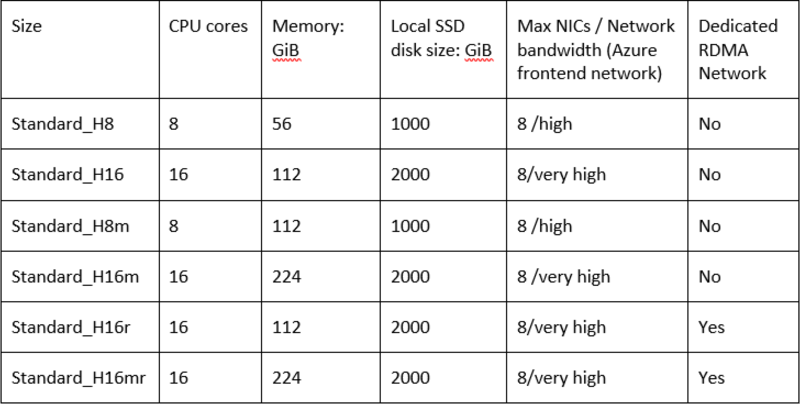 Non-RDMA-enabled H-series sizes can be deployed with various Linux distributions and Windows Server OS images available in the Azure Marketplace. RDMA-enabled H-series VM sizes can be deployed using Windows Server 2008 R2, Windows Server 2012, Windows Server 2012 R2, and CentOS-based 7.1 HPC and SUSE Linux Enterprise Server 12 SP1 HPC images. For more information and a quick guide on how to get started, see the Linux and Windows documentation. With this milestone in our HPC journey in the cloud, we’d like to re-emphasize our excitement in bringing world-class High Performance Computing infrastructure capabilities through the Cloud to every engineer and scientist in the world.